Elevated, providing absolute privacy and nestled amongst lush greenery, the symphony of natural beauty and exquisite craftsmanship of this home meet in a breath-taking way. Uniquely designed to seamlessly blend interiors with beautiful, panoramic views. An elegant foyer and staircase lead upstairs where grand receptions provide fabulous and versatile spaces and every attention to quality and elegance has been thought of. Luxurious touches include solid wood floors, master crafted doors and cabinets, bespoke wrought iron finishes, high ceilings accentuated with mood lighting, beautiful chandeliers and sky lights. The outstanding 'master chef' kitchen with its imposing centre island, gourmet worthy appliances and high end fittings and finishes form the heart of this home. Stack back doors open onto a deep undercover patio and chill lounge with magnificent views. Three luxurious en-suite bedrooms upstairs, all opening to individual patios with beguiling views. The fourth en-suite bedroom/study, is located downstairs and enjoys access to the pool and pretty garden. The master suite has every comfort imaginable. The magical garden with its sun dappled pool and manicured garden, provide an idyllic sheltered haven. Garaging for eight cars plus an expansive forecourt to accommodate ample additional guest parking, a borehole and sophisticated security systems, complete this extraordinary home. Delight in the Constantia outdoor lifestyle with gorgeous green belt strolls, cycles, mountain hikes, horse rides, Saturday Parkrun's, scenic drives to nearby beaches and world class golf courses, restaurants and magnificent surrounding wine farms which include Buitenverwachting, Constantia Uitsig, Groot Constantia, Beau Constantia, Klein Constantia, Steenberg and Eagles Nest. 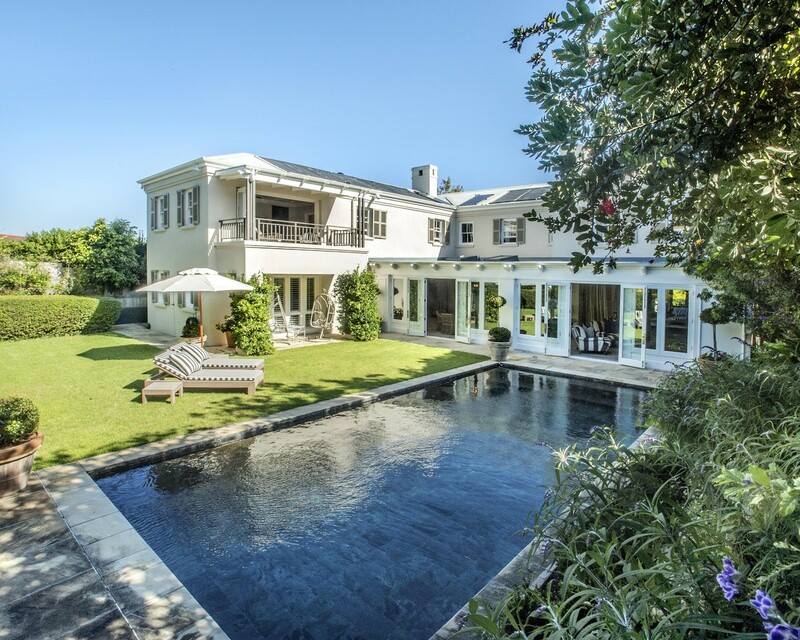 Easy access to Constantia Village and Steenberg Shopping Centres, Constantia Uitsig Bike Track, Virgin Active Gym and Constantia Sports Grounds - as well as top schools including Herzlia, The American International, Reddam House, Constantia Pre-Primary and Constantia Waldorf.